The Observatory Hotel is the ideal base from which to work and explore Australia's most vibrant city. Superbly located near Sydney's historic Rocks and central business district, nestled near the vibrant harbour and the world famous Sydney Harbour Bridge, this is an enviable location close to the bustling heart of the city. 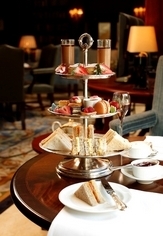 Sydney is renowned for its relaxed lifestyle and nowhere is this more true than at The Observatory Hotel. What could be more relaxing than a visit to The Day Spa at The Observatory Hotel, with a wide choice of luxurious face and body treatments, ancient therapies and a flight reviver program to help our international guests readjust to the new time zone. The hotel's 20-metre heated pool, mirrored by a ceiling of fibre optic lights designed to recreate the constellations of the southern hemisphere, beckons invitingly. For the more energetic, work out in the fully equipped gymnasium, or enjoy a game of tennis, which can be easily arranged at our court opposite the front door. 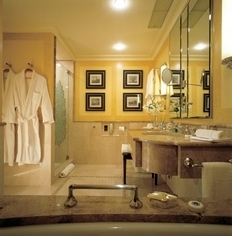 Spacious, elegant, beautifully appointed, the rooms and suites at The Observatory Hotel are designed to meet the needs of the most fastidious guest.The hotel offers 78 deluxe rooms, 9 Junior Suites, 12 Executive Suites and the Observatory Suite, with some suites and rooms interconnecting. Three ground-floor rooms have been adapted for the convenience of disabled guests. 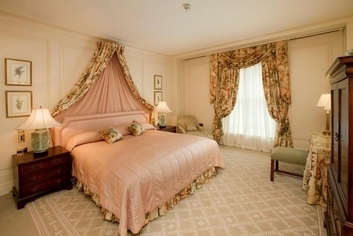 The second floor, which is completely non-smoking, features duvets in each bedroom. Bathrooms feature heated towel rails and separate showers, and every room has touch-control air conditioning, as well as sash windows to allow cool harbour breezes to circulate. Each room has detachable hairdryers, CD and video players (a wide selection of CDs is available from the CD Library), international news service and movies on demand, as well as fax/modem facilities, voice mail and four telephones. The Observatory Hotel is renowned for its fine cuisine, ranging from elegant dining in the Galileo Restaurant to the light menu in the club-like Globe Brasserie & Bar. Opulently decorated with Fortuny fabrics and original art, Galileo Restaurant offers a fusion of French and International cuisine from Michelin Star Chef Masahiko Yomoda. Globe Brasserie & Bar is a fantastic all-day dining brasserie offering a relaxing haven just moments from The Rocks. The Brasserie features fresh local and seasonal produce and mouth-watering favourites as beer-battered fish and chips, a popular tapas menu and The Observatory club sandwich. 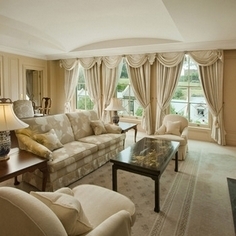 When you want the very best, indulge in one of our exclusive EXECUTIVE SUITES with separate Lounge Room & Bedroom. 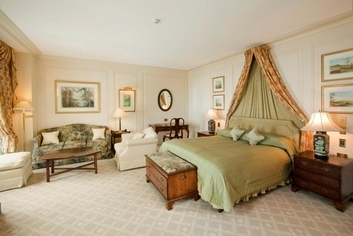 This room only rate includes a Strawberry Platter on arrival, Newspaper & access to the Day Spa. Rates are for 2 people only. Special Room Only rate inclusive of welcome strawberry platter on arrival, access to the Day Spa facilities and daily newspaper. 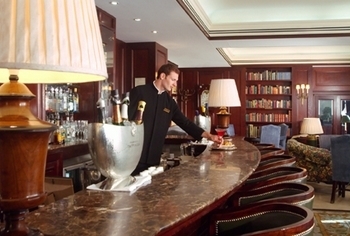 Discover truly outstanding service in a welcoming and intimate atmosphere at The Observatory Hotel. With all rooms bathed in natural light and the personalized service of our well trained team of professionals you will notice a difference a difference that offers sophistication and efficiency in a warm and personable environment a difference that is The Observatory Hotel. Located just minutes from Sydney's Central Business District, The Observatory Hotel is renowned for making the organization of your special event easier. Whether you are holding a monthly board meeting, your work Christmas Dinner or your Wedding Day, The Observatory Hotel team will ensure that your event is an experience that will be remembered. The simplicity of the Cornwallis Suites allows you to add your own special touches for your important event, perfect for your wedding or the launch of your latest product. The Orient Room transports you to another time, providing the inspiration needed for those all important strategy meetings. Rates shown are for 2 people. Valet Parking Available at a cost of AUD $40.00 per car per night. From Sydney's Kingsford Smith Airport follow the signs to Sydney, CBD. Go down George Street to The Rocks area. Turn left into Essex Street at the lights before the Regent Hotel. Take the first right into Harrington Street, left into Argyle Street and then left again into Kent Street. The hotel is 200 metres on the right across from the tennis court. Shopping in the city centre. Attend a performance at the Opera House or nearby theatres. Walk around The Rocks district and Circular Quay. Picnic on Observatory Hill and watch the stars from Sydney Observatory. Climb the Sydney Harbour Bridge with Bridgeclimb, a three minute walk from the hotel. Take in the sights of Sydney Harbour by ferry or a cruise. Dine in our five star, award-winning Galileo Restaurant or Globe Bar, the perfect venues for that special occasion. Relax and be pampered in the magnificent surroundings of our day spa with complimentary eucalyptus steam and cleansing sauna, robes, slippers, towels, toiletries, hair dryers, cooling lemon-water and fresh fruit. Walk to the Sydney Theatre Company and enjoy the latest show.